Here’s the facts: Chicken dark meat is richer in nutrients and contains more zinc and iron than white meat. Zinc is a trace mineral that’s found in every cell of your body and is needed for growth and reproduction. Zinc supports the immune system, heals wounds, and helps maintain your sense of taste and smell. Iron is critical because it helps transport oxygen throughout the body. Iron is also necessary to maintain healthy cells, skin, hair, and nails. Dark meat is also rich in vitamins A, K, B6, B12, niacin, folic acid, pantothenic acid and minerals like selenium and phosphorus. And, it contains more taurine than white meat. I love chicken drumsticks because they are a great tasting finger food. I like a barbecued drumstick hot or cold. I’ll even eat a drumstick for breakfast. I like to purchase eight drumsticks, specifically so I can have leftovers. 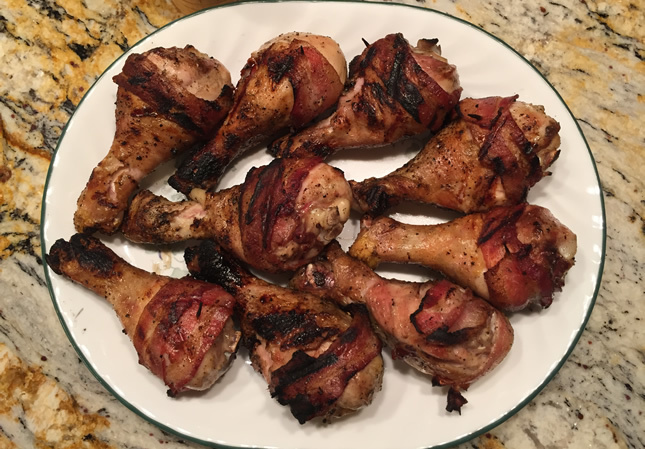 I also wrap the ends of the thigh with bacon because many times the skin is short, exposing the drumstick meat to grill heat, which dries it out. With that background, the recipe is below. Total cooking time is 30 to 45 minutes. Enjoy the entire drumstick and the bacon as well. Savor every bite! This entry was posted in Nutrition and tagged Appetizer, Chicken, Dinner, Drumsticks, Healthy Eating, Meals, Recipe, Wings.